As we wind down the summer everyone begins looking to, what we call “Century Season.” Come September it seems just about every weekend there is another organized century ride, one of our favorite century’s of the summer is the Culpeper Cycling Century, which takes place on Saturday, October 1st this year. This year we have teamed up with VeloConcepts to bring you a century training ride series in preparation the Culpeper Cycling Century. Every Saturday, from now until September 24th we will be hosting a free training series every Saturday starting from VeloConcepts. This training series for advanced cyclists looking to have their best century yet. Each week will build up on the previous both in distance and speed and in between we will arm you with a weekly training plan crafted by Professional Mountain Biker and endurance athlete, Jeremiah Bishop to make sure you will have a personal best century ride. The route will change each week, and will feature various sections of the Culpeper Century route. On our longer rides (greater than 60 miles) we will have free sag support so that you can stow extra clothes, water or food. Plus mechanics will be on hand to help with any on the road repairs. The training series will culminate with the Culpeper Century on October 1st, however all are invited and encouraged to participate in the Alpine Loop Gran Fondo, Mt Solon Metric Century in Harrisonburg on Sunday, September 25th. This ride will be the perfect last chance training ride before the big 100 mile day the following weekend. Before each ride, VeloConcepts will be offering free breakfast and coffee, along with a riders meeting where we will review the day’s route and answer any questions. The group will roll out at the prescribed start time (which will change from week to week based on weather i.e. heat and distance to be covered) as a group. While the ride leaders will try to keep the group together, riders should be expected to average 16-18 mph and be self-sufficient in case of any issues. 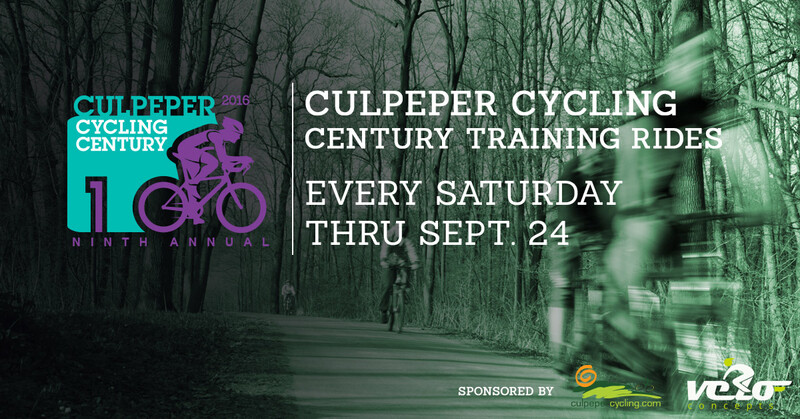 If you are planning on riding the 2016 Culpeper Century, then you do not want to miss these training rides. Join us for just a few weekends or all the rides and have your best century yet.